From the RadMenu Smart Tag, click on the Build RadMenu link. 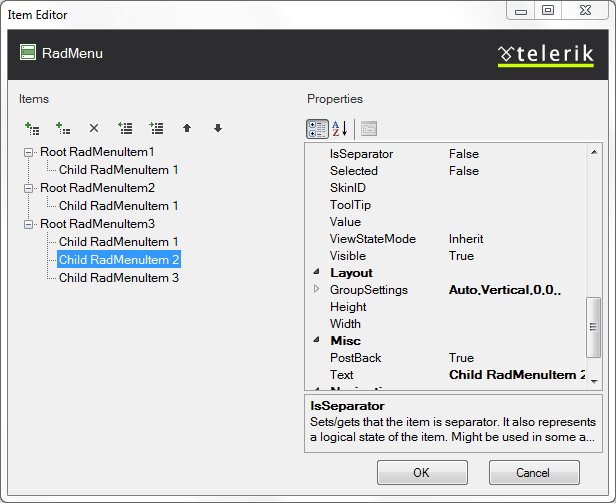 Right-click on the RadMenu component and select Build RadMenu from its context menu. Adds a root item to the menu in the next available position. Root items are the top-level items (menu items with no parent item). Adds a child item to the currently selected menu item. The child can belong to either a root item or another child item. Deletes the currently selected menu item. When you delete a menu item, its child items are deleted as well. Moves the currently selected menu item up a level, making it a sibling to its parent item (following the parent item). Moves the currently selected menu item down a level, making it the child of its previous sibling. Moves the currently selected menu item backward in its current list of siblings, so that it precedes the previous sibling. Moves the currently selected menu item forward in its current list of siblings, so that it follows the next sibling. Value lets you associate a text value with the menu item that you can use when programming the menu behavior. CssClass, ClickedCssClass, DisabledCssClass, ExpandedCssClas, and FocusedCssClass control the appearance of the menu item when it is in its normal state, clicked, disabled, expanded, and holds input focus, respectively. ImageUrl, ImageClickedUrl, DisabledImageUrl, ExpandedImageUrl, and HoveredImageUrl let you specify an image that appears on the left of the menu item when it is in its normal state, clicked, disabled, expanded, and when the mouse hovers over it, respectively.